Should We All Stop Eating Almonds? The non-irrigated portions of California’s Central Valley look like sand boxes. 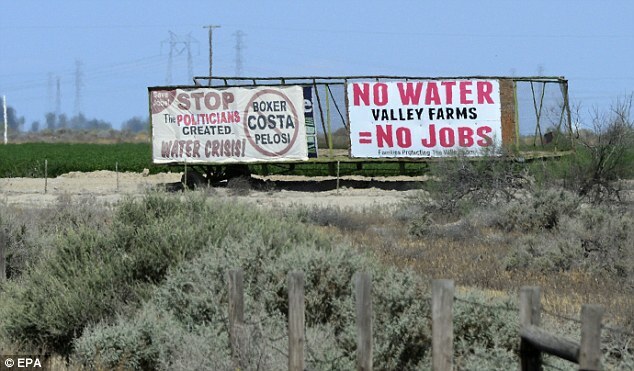 Wooden signs printed in red hang on the fences of dried up orchards, reading “No Water = No Jobs,” “Solve the Water Crisis,” and “Congress Created Dust Bowl.” In the middle of this drought, one of the most severe in the past 150 years, a statistic has taken center stage: it requires approximately 1.1 gallons of water to produce a single almond. Despite the crop’s huge water demands, last year 860,000 acres of Central Valley land was utilized for almond farming — requiring 10 percent of the state’s water. The almond is not alone, though. Cherry, lemon, apricot, and peach trees are all permanent crops that can’t run fallow anytime without the farmer losing the grove. These crops are thirsty and expensive — because they have to be tended to (and watered) year-round. But they also often command a much higher price than vegetables or other row crops. Because of this, in the past ten years the number of permanent crops in California doubled. Drought conditions, however, make current permanent crop production generally unsustainable, despite the fact that their demand, and in particular the demand of the almond, is only climbing. “You have guys who have planted these permanent crops and are willing to pay and pump groundwater to keep that investment alive,” says Claire O’Connor from the Natural Resources Defense Council. “If they don’t have a consistent source of water, they will pay to transfer water from folks who have a reliable source,” or they will pump groundwater, something that has become a common practice in California. According to a study in UC Davis, farmers in California are over-drafting ground water by 63 trillion gallons. FEATURE STORY: Who Stole the Water? In addition to the problem of permanent crops, much of California farmer’s irrigation methods implement old, wasteful tech. According to O’Connor, about half of California farms use gravity based-irrigation — flooding their fields like they did in ancient Mesopotamia rather than using high-tech drip and sprinkler systems. Another problem is scheduling. The way that farmers currently receive water is generally based on a rotation or a timetable determined by the irrigation district — not the crop type. “More scientific scheduling can not only reduce your water needs, but also improve your yield, because you are giving the crop what it needs when it needs it,” says O’Connor. All this waste adds up. The NRDC estimates that through the implementation of more efficient irrigation scheduling, increased adoption of modern irrigation tech (which many permanent crop farmers are moving toward) and increased regulated deficit irrigation, California farms could reduce their demand by 5.6 to 6.6 million acre feet annually, enough water to provide 11 million to 13 million families with water for an entire year.